Get started on your stress-free vacation today! Experience complete relaxation and luxury as well as adventure with our all-inclusive packages. We handle flights, hotels, cruises, transportation, excursions, and so much more! 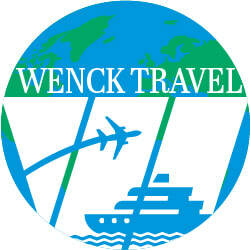 Some of our most popular partners and travel destinations are below but don't feel confined to just those, at Wenck Travel we can take you where you want. Check out our destination guides to see more in-depth all of the possible getaway locations. Carnival Cruise Line all about fun vacations at sea and ashore! A Carnival cruise features day and nighttime entertainment like stage shows, musical performances, deck parties, casinos and more. (Like waterslides!) We invite our guests to come as they are — fun for all, all for fun, we say — and we make everyone feel right at home with comfy staterooms, attentive service, casual and elegant dining, plus a variety of bars and gathering places indoors and out. Guests enjoy this unique experience against the backdrop of some of the world’s most beautiful seaports. Our 24 ships operate 3 to 16 day voyages, departing from every coast in the U.S., plus from Canada, Puerto Rico, Europe and Barbados. While we’re best known for Caribbean cruises, we sail to other exotic and amazing destinations like Mexico, Alaska, The Bahamas, Cuba, Hawaii and the Mediterranean. Additionally, Carnival Cruise Line Australia now has two ships, and offers cruises from Sydney to New Zealand, the Pacific Islands and Singapore. Celebrate your love on a breath-taking beach in paradise! Whether it's just the two of you or everyone you know, we'll plan the perfect bachelor/bachelorette party, intimate ceremony, and exciting honeymoon of your dreams!